Entrance to Stonington Harbor. 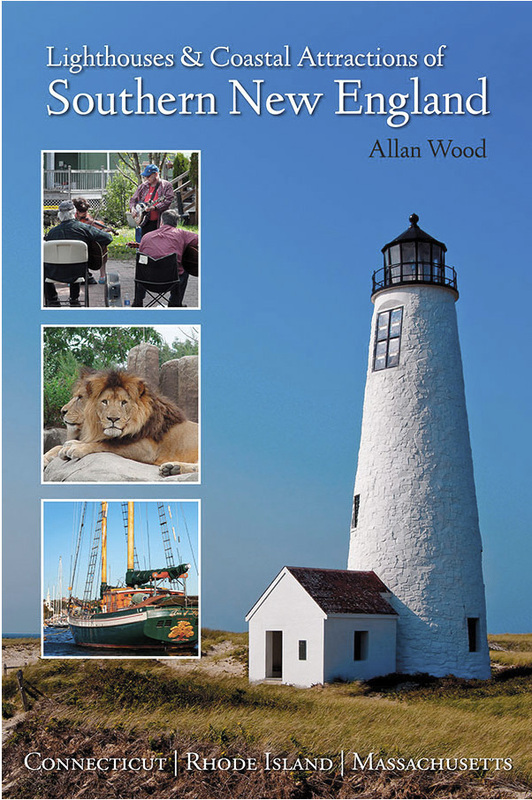 The lighthouse serves as the town library and is open to the public during regular hours. Grounds are also open to the public. During the War of 1812, in 1814, the townspeople of Stonington, who were badly outnumbered and outgunned, still fought bravely and managed to repel an attack by five British warships. 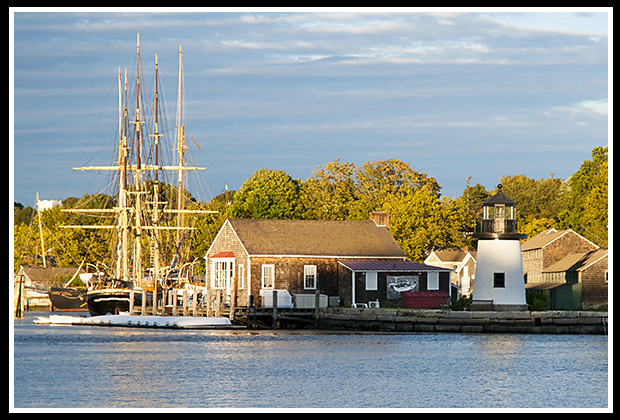 In the early 1800’s, Stonington became a center for shipbuilding, whaling, and fishing industries, prompting the need for the current Stonington Harbor lighthouse to be built in 1823 at the entrance to the harbor. It was the first lighthouse built in Connecticut. It was later rebuilt in 1840. The lighthouse was offered for sale by the US government. The winning and only bid came from the Stonington Historical Society in 1925, which completely refurbished the structure with the help of local volunteers and tradesmen, and opened it to the public as a museum. 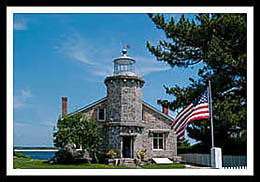 The Old Lighthouse Museum still operates today, and boasts as the only lighthouse on the Connecticut mainland that is regularly open to the public. The original whale oil light from the first Stonington light is one of the many items on display at the museum. Stonington is a beautiful historic village, with many well-preserved houses and architecture from the 18th-century and 19th-century fishing and whaling days. The lighthouse itself is known as the Old Lighthouse Museum owned by the Stonington Historical Society and is now a library of the village of Stonington. You can park nearby and visit the lighthouse and surrounding grounds, and enjoy nearby DuBois Beach, which is within walking distance of the lighthouse. Stonington is also one of the main starting points of the Connecticut Wine Trail, highlighting 25 of Connecticut's wineries. At the wildlife sanctuary of Denison Pequotsepos Nature Center, you can attend one of their environmental education seminars, or take a leisurely nature trail hike. Mystic Seaport nearby is an outdoor maritime museum replicating a typical New England seaport staged around the 19th century. You'll be educated about the craftsmen and skills utilized during this era, and explore fully reconstructed vessels from the whaling and tourism industries, and how they used the stars to navigate. These include the world's only functional whaling ship, the Charles W. Morgan, and a 106 year old wooden steamboat, the Sabino. You'll also find a full sized replica of a New England lighthouse constructed familiar to Brant Point light on Nantucket Island in Massachusetts. This is where you can explore, learn, and fully experience our New England maritime heritage, as those who've sailed these vessels many years ago. For more info, you can check out their blog site. You can also get a nice view of the seaport from across the river. The Mystic Aquarium provides educational and up close exhibits of marine life that include sharks, jellyfish, eels, barracuda, and sea lions. It also has one of the largest Beluga Whale exhibits in the country. Captain Nathaniel B. Palmer House is a Victorian era historic house turned into museum of the pioneering Antarctic explorer, Nathanial Palmer. Turn south on Route 234 (Pequot Trial) about a half-mile to North Main Street. Turn left on North Main about 1.5 miles to light at intersection with US Route 1. Cross Route 1 and continue straight to stop sign. Turn left and then take next right over railroad bridge onto Water Street. Follow Water Street through historic Stonington Village to the end. Park at the Point in front of duBois Beach and walk up to the Lighthouse. They offer scenic tours and harbor cruises from Watch Hill, Rhode Island, to Stonington and Mystic, Connecticut, and out to Fishers Island, New York.